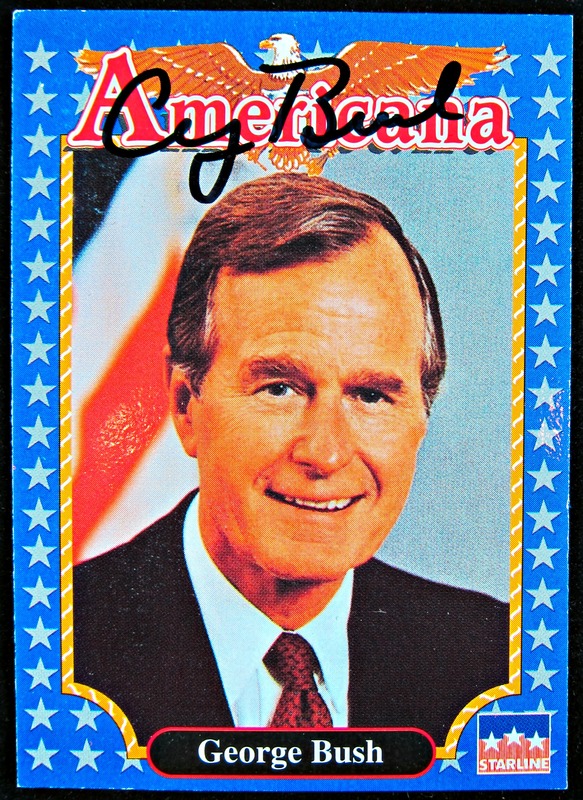 Starline Americana autographed George Bush Sr card. George Herbert Walker Bush (born June 12, 1924) is an American politician who was the 41st President of the United States from 1989 to 1993 and the 43rd Vice President of the United States from 1981 to 1989. A member of the U.S. Republican Party, he was previously a congressman, ambassador, and Director of Central Intelligence. He is the oldest living former President and Vice President. He is also the last living former President who is a veteran of World War II. Since 2000, Bush is often referred to as “George H. W. Bush”, “Bush 41”, “Bush the Elder”, or “George Bush Sr.” to distinguish him from his eldest son, George W. Bush, who became the 43rd President of the United States. Prior to his son’s presidency, he was simply referred to as George Bush or President Bush. Bush became involved in politics soon after founding his own oil company, serving as a member of the House of Representatives and Director of Central Intelligence, among other positions. He failed to win the Republican nomination for President in 1980 but was chosen as a running mate by party nominee Ronald Reagan, and the two were elected. During his tenure, Bush headed administration task forces on deregulation and fighting the “War on Drugs”.